Everybody says you can do anything with a law degree - this is where you find out how. It doesn’t matter if you want a new job in the law, you want to leave the law . . . or you don’t know yet. Sarah has helped lawyers make all kinds of transitions from going in house to finding a public interest position to going to the government or getting a job in project management. 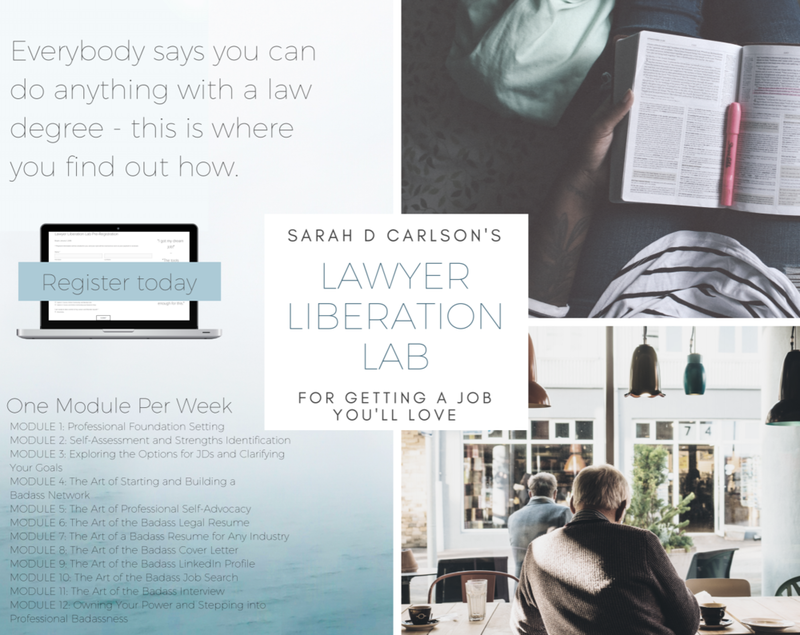 Through the 12-week Lawyer Liberation Lab program, you will be given everything you need to get a job you’ll love, and you’ll be fully supported as you take the steps to get there. Through the twelve-weeks, you will learn about the options available to you as a JD, you will clarify your career goals, and you will be able to articulate how your goals align with your strengths, interests, values, and your vision for your future. In short, you will identify job prospects that will actually make you happy, and THEN you will be guided through the steps to getting there. a list of target employers to hit the ground running. the confidence and the tools to keep going and/or duplicate this process wherever your career may take you. The result is a curated personal brand and message that is tailored to your strengths and career interests that will help you make the career move you're looking for, whatever that may be. In fact, using the Lawyer Liberation Lab process, ALL OF SARAH'S INDIVIDUAL CLIENTS HAVE LANDED INTERVIEWS WITH THEIR TOP EMPLOYERS WITHIN TWELVE WEEKS!!! Is it time to stop struggling and to get a job (that you’ll actually love)??? Looking for inspiration? Click here! In addition to the weekly course modules and assignments, you also gain access to an interactive online Slack community where you can ask questions, get resources, and chat with Sarah and other participants. You will also join weekly small group calls in which Sarah will go over the materials, answer questions, address concerns, pump you up, and ensure you feel prepared and supported as you make moves toward your career transformation. ***Lawyer Liberation Lab calls occur Thursdays at 7:00 pm EST. As a Lawyer Liberation Lab participant, you will also be able to continue to subscribe to the calls and online community after the 12-week course ends. This way, you will have access to Sarah and support on your job search for as long as you need it!